Amit Singal, M.D., M.S., has had several patients who were cured of liver cancer, but he would like to have many more. A hepatologist, Dr. Singal treats patients with liver disease and cares for transplant recipients pre- and post-surgery. He is an Associate Professor of Internal Medicine in the Division of Digestive and Liver Diseases at UT Southwestern Medical Center. He is Medical Director of the UT Southwestern Liver Tumor Program and Clinical Chief of Hepatology. Most of Dr. Singal’s research examines how to diagnose and treat liver cancer before it becomes incurable. Unfortunately, he says, too many patients are diagnosed when their cancer is already in the advanced stages. Dr. Singal is a native of the Detroit area and completed most of his medical education at the University of Michigan. He earned his medical degree and a Master of Science at the University of Michigan, as well as fellowships in gastroenterology and transplant hepatology. Dr. Singal completed his internal medicine residency at the University of Washington in Seattle. Dr. Singal began his career at UT Southwestern in 2010. He was drawn to Texas and UT Southwestern because liver cancer is a particular problem in Texas, and he believes UT Southwestern is the best place to help do something about it. Dr. Singal is doing everything he can to change that. He is working with primary care physicians and other hepatologists to better understand and follow guidelines for liver cancer screening. People with liver disease, who are at risk for liver cancer, should be screened every six months, but less than 20 percent of patients are currently having this done. He’s also hopeful about new advances in medicine. Dr. Singal is board certified in internal medicine, gastroenterology, and transplant hepatology. He is also a member of the American Gastroenterology Association, the American College of Gastroenterology, the American Association for the Study of Liver Diseases, and the International Liver Cancer Association. Dr. Singal has received numerous grants, including those from the National Institute of Health (NIH), Cancer Prevention Research Institute of Texas (CPRIT), and Department of Defense (DOD). His research has been published in many peer-reviewed publications, such as JAMA, Gastroenterology, Hepatology, Cancer Epidemiology Biomarkers & Prevention, and Clinical Gastroenterology and Hepatology. Dr. Singal also lectures frequently on liver cancer throughout the country. In 2018, he was named a Super Doctor by Texas Monthly. During his off time, Dr. Singal likes to travel internationally. And he loves to cheer on his home teams – the Michigan Wolverines, Detroit Lions, and Detroit Red Wings – when they are in Dallas. Amit Singal, M.D., M.S., has declared war on liver cancer, which is the ninth leading cause of cancer-related death in the U.S. and the fastest-growing cancer in Texas. A hepatologist, Dr. Singal treats patients with liver disease and cares for transplant recipients pre- and post-surgery. He is an Associate Professor of Internal Medicine in the Division of Digestive and Liver Diseases at UT Southwestern Medical Center. Additionally, he serves as Medical Director of the UT Southwestern Liver Tumor Program and Clinical Chief of Hepatology. Dr. Singal came to Texas and UT Southwestern so he could help do something about liver cancer in the Lone Star State. Texas has the second-highest incidence rate of liver cancer in the nation, and he believes that it will only become an increasingly more important problem over the next two decades. Dr. Singal believes UT Southwestern has the cutting-edge therapies and committed doctors who can make a difference in this field. Most of his research examines how to diagnose and treat liver cancer when curative therapies exist. 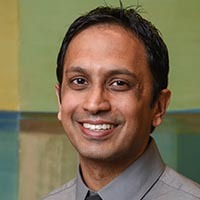 He believes it is important to work with primary care physicians and other hepatologists to follow published guidelines for liver cancer screening among at-risk patients. People with liver diseases who are at risk for liver cancer should get screened every six months, but less than 20 percent of patients are currently having this done. Dr. Singal is dedicated to improving this care over the next several years. Dr. Singal also works closely with patients with liver cancer to help them choose the best treatment options, and he is willing to do whatever it takes to get his patients through the process. Utilization of hepatocellular carcinoma surveillance among American patients: a systematic review. Improving Hepatocellular Carcinoma Screening: Applying Lessons From Colorectal Cancer Screening. Detection of Hepatocellular Carcinoma at Advanced Stages Among Patients in the HALT-C Trial: Where Did Surveillance Fail? Improved Post-Transplant Survival in the United States for Patients with Cholangiocarcinoma After 2000. Failure rates in the hepatocellular carcinoma surveillance process. Recent advances in the treatment of hepatocellular carcinoma. Patient Involvement in Healthcare is Associated With Higher Rates of Surveillance for Hepatocellular Carcinoma. Effectiveness of hepatocellular carcinoma surveillance in patients with cirrhosis. Surveillance for Hepatocellular Carcinoma: How Can We Do Better? Q&A by Amit Singal, M.D. Dr. Amit Singal on delivering patient care.